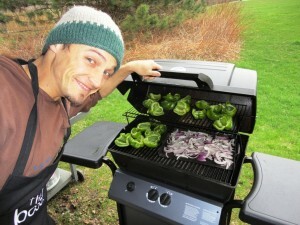 On Sunday May 1st, the OAC held its annual Earth Day event at Rattlesnake Point. After a one year hiatus it was good to be back. About 30 volunteers from the climbing community showed up in cold and rainy weather to help eliminate the invasive garlic mustard plant. Climbers were educated about garlic mustard by a Halton Conservation ecologist before heading into the field to start the work. When all was said and done, climbers collected about 30 garbage bags full of the pesky plant. This significant haul was a great start, but is only a dent in the population; it goes to show just how invasive this plant can be. 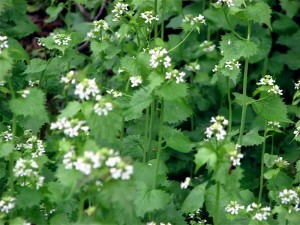 Garlic mustard will spread on the forest floor and prevent all other species from growing, including young trees! After the work was done, climbers and Conservation Authority staff got together to enjoy a tasty BBQ lunch, a raffle for great prizes donated by our sponsors, and some camaraderie. Lucky winners left with a full belly, a 70m 9.8 rope, Black Diamond quick draws, crag packs and more. A special thanks to those in the climbing community who came out in the cold and the rain to make this event a success. If you know someone who was there, give him/her a pat on the back! After the event, a crew headed down to Climber’s Rock to take advantage of the discounted day passes for Earth Day volunteers and had a great session of climbing and bouldering. Climber’s Rock generously donated a portion of the proceeds from those day passes and has since donated an additional $100 to the OAC. 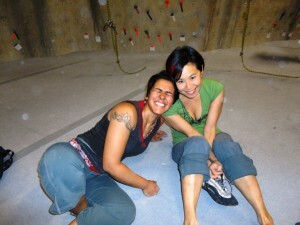 Thanks Climber’s Rock! Many climbers have asked us for more events and more ways to help. The OAC is listening and we are proud to announce our third event this spring, in conjunction with Free Spirit Tours. We hope you can make it on May 29th to help show some love to Metcalfe Rock in the form of a clean up and trail work… more info coming shortly. Plan on being there!